ToeOFF® 2.0 is the updated version of the Original ToeOFF®. This new model have several new features that has been asked for from customers over time. The shape is more organic, with shorter side extensions and more rounded shape. Also the surface is smoother and more scratch resistant. The MikroFix is pre-attached on the inside of the brace to accomodate a faster fitting procedure. It is also available with two different strap systems - With D-ring or without D-ring. Another feature is the increased height on size X-Large with 2 cm more compared to the Original ToeOFF® . ToeOFF® 2.0 are designed to manage footdrop in conditions such as Stroke, Multiple Sclerosis, Post Polio Syndrome, Muscular Dystrophy, Spinal Cord Injuries, Traumatic Brain Injuries, Guillian-Barre Syndrome, Charcot-Marie-Tooth, Myelomeningocele, Neuropathy or Cerebral Palsy. 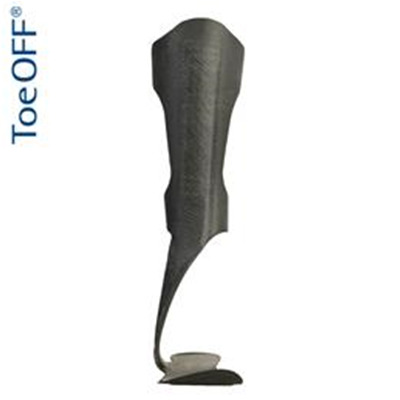 ToeOFF® 2.0 are designed to support gait in conditions such as Posterior Tibialis Tendon Dysfunction (PTTD) and toe amputations. BlueROCKER® can also be used for patial foot amputations, most proximal level is Chopart.